How do I know the URLs of the ads on my site? 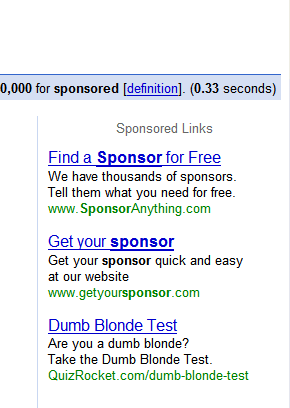 So does "Sponsored Link" or "Sponsored By" mean sematically? 1. Advertiser who pays for part or all of a television or radio program by running one or more advertisements during the program. Sponsorship entitles the advertiser to a mention as the program's sponsor, and to a specific amount of commercial time throughout the program, depending on the time of day, the type of program (local vs. Network), and the station's regulations. 2. Donor who provides a substantial portion of the funding to an event. Event sponsors typically receive publicity such as banners and signs at the event as well as prominent mention in printed materials and event advertisements. A title sponsor is added to the name of the event, such as "Bailey's American Ski Classic." Sponsorships enable marketers to leverage their marketing dollars by gaining more publicity and goodwill than those same dollars could have purchased directly. See also public relations; underwriter. Sponsored links are text-based advertisements that describe an advertiser's Web site and the products and services offered. A hyperlink is included, so that interested consumers may click on the advertisement and go to the advertised site. Typically charged on a Pay per click model, when Web surfers click on an advertisement and visit the advertiser site, charges are made on a pre-determined amount that the advertiser has agreed to pay. The prices of sponsored links are usually set through a bidding system, where higher bids (along with other factors including performance, etc.) result in more prominent placement. If you would like to add a URL to your filter list but the path is not visible, please do not click on the ad to retrieve the URL. Clicking the ads on your site will artificially drive up advertiser costs. We suggest using the AdSense Preview Tool to view the ads that will show on each of your pages. The Preview Tool allows you to click through to the advertiser's site without generating invalid clicks or impressions, and provides an easy way to display the target URL of all ads. For more information about the Preview Tool, including a download link, please read our What is the AdSense preview tool?. Alternatively, to view the URL of ads directly from your webpages, you can also follow these steps: * Right-click on the ad title and select either 'Copy Shortcut' (IE) or 'Copy Link Location' (Netscape). * Paste the selection into a text editor for editing. * The destination URL of the ad includes the text between 'adurl=' and '&'. As an example, the copied URL will appear as follows: http://pagead2.googlesyndication.com/pagead/adclick?sa=l&(...)&adurl=http://www.blogger.com&client= or http://www.googleadservices.com/pagead/adclick?adurl=http://www.blogger.com&sa= The destination URL in the example above is 'http://www.blogger.com'. You can view the ad by entering the URL into your browser's address bar. Adding 'blogger.com' to your filter list will block ads originating from this domain. Affiliate URLs Affiliate Policy We do not allow data entry affiliates to use AdWords advertising, but all other affiliates may participate in the AdWords program. However, we monitor and don't allow the following: * Redirect URLs: Ads that contain URLs that automatically redirect to the parent company. * Bridge Pages: Ads for web pages that act as an intermediary, whose sole purpose is to link or redirect traffic to the parent company. * Framing: Ads for web pages that replicate the look and feel of a parent site. Your site should not mirror (be similar or nearly identical in appearance to) your parent company's or any other advertiser's site. If you're an affiliate and are paid to send traffic to another site or a distributor, the company you're promoting may also require you to comply with their own terms and conditions. Please note that we'll display only one ad per search query for advertisers sharing the same top-level domain in the display URL. Learn more about when affiliate ads show. We'll only display one ad per search query for advertisers sharing the same top-level domain in the display URL. This means that if you're an affiliate advertiser, your ad may not show for a query because another affiliate or the website that runs the affiliate program also has ads using the same (or a similar) domain in the display URL. Also, your site should not mirror (be similar or nearly identical in appearance to) your parent company's or another advertiser's site. For example, for the domain google.com, we would determine the following URLs and display URLs to be equivalent: * home.google.com * www.google.com * google.com * www.google.com/home * www.Google.com However, we'd determine the following display URLs to be distinct, since each has a different top-level domain: * www.google.co.uk* * www.google.fr * www.google.com * www.google.edu *Domains with a specific extension are considered distinct. For more information about this change, please review the January 2005 Google AdWords service announcement. Helpful Definitions: Display URL This is the URL displayed on your ad to identify your site to users. This URL displayed is limited to 35 characters; it need not be the same as the URL your ad links to, but it should be an actual URL that is part of your site. Domain Website domains are a naming procedure by which web users may identify a particular website address and location (e.g., www.google.com). They are usually made up of two parts: a name and a category. The following are common URL domain categories: .com (commercial), .edu (education), and .gov (government). Domain categories can also be location-specific, for example: .fr (France) , .br (Brazil), or .jp (Japan). In some cases, one category is appended to another category, for example: examplename.co.uk, examplename.com.ph, examplename.org.uk). What are Sponsored Links? 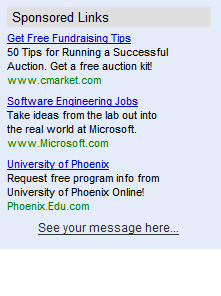 Sponsored links are sites that pay for placement next to Google Maps search results. These advertisements are always clearly labeled as "Sponsored Links." Sponsored links are targeted to the topic and location of a search (e.g. hotels near lax) and are thus extremely relevant. They also provide additional information such as an option to call the business and get directions. May not place misleading labels above Google ad units - for instance, ads may be labeled "Sponsored Links" but not "Favorite Sites"